Our biggest Miami Invisalign sale of the year is back, offering families unbeatable savings on the revolutionary new invisible braces system! From now until December 31st, all new Invisalign patients receive $1,000 off full treatment. Bi-monthly check-ups are included, providing new patients with professional guidance and support while creating the smile of their dreams. iTero Digital Impressions use high resolution digital cameras to take a “digital impression” of the entire oral anatomy. Patients love iTero technology because it means no more goopy liquid plaster. Creating aligners from iTero digital impressions also means more precisely made aligners, which improves patient comfort and effectiveness. A holistic approach to dentistry ensures that patients learn more about total body health and wellness during Invisalign treatment. At Assure A Smile, patients learn about specific lifestyle choices that are needed to create healthy teeth and gums for life. There are many reasons to choose Invisalign this December. Here are the 7 best reasons, based on feedback from current patients as well as research by leading oral health specialists. 1. 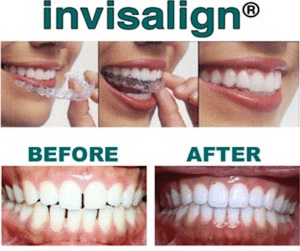 Invisalign is clear and removable. Patients who choose Invisalign over traditional metal braces love the fact that the aligners are clear and removable. They can smile in confidence knowing that the aligners are nearly invisible when being worn. 2. Removable braces are better for oral health. Patients, dentists, and numerous studies all agree: Invisalign is better for oral health. Since the aligners are fully removable, patients can brush and floss as normal. There are no metal brackets or wires, making it easier for patients to completely rid their mouths of the food debris that otherwise causes oral bacteria, cavities, and gum disease. 3. Smiling often can improve cardiovascular health. Researchers have also found that cardiovascular health improves with frequent smiling. In one study, researchers found that smiling regularly correlated with lower levels of arterial plaque, the material that corrodes arteries and leads to heart attack or stroke. 4. A healthy smile improves your immune system. Smiling regularly can make it more difficult to become sick, according to additional research by family doctors and psychologists. As writers explain in an article for Senior Life Health, smiling might strengthen the immune system by promoting mental and emotional positivity. 5. Having confidence in your smile can reduce feelings of anxiety. Did you know that even forcing a smile could promote feelings of happiness? This discovery was made when a team of researchers asked participants to hold a pencil between the upper lip and nose. During the exercise, researchers measured participants’ brain activity and compared it to the activity of other participants who laughed and smiled naturally. The study showed that the “pencil holding” group triggered the same pleasure centers in the brain as the “natural smilers,” showing that forcing a smile can cause the brain to release the same feel-good chemicals. In this way, having the confidence to flash a smile curbs feelings of anxiety and helps reduce stress. 6. People who smile often live longer lives. Researchers Abel and Kruger released an interesting study in January of 2011 titled “Happy People Live Longer.” In it, they shared new data that showed how people who smile frequently have a longer life expectancy than those who do not. This is not surprising, as high volumes of other research also show how smiling improves heart health, bolsters immunity, and promotes emotional health. As a Primer-Preferred Invisalign Provider, Dr. Herrmann and the Assure A Smile team have the experience and expertise needed to help patients create the smile of their dreams. To learn more about our December Invisalign Special, please call 305-274-0047 today!